I’ve been so consumed with technology these past few weeks that I’ve all but forgotten to mention what really counts in life, and that’s sports. First, and my first love, golf. What in the world got into Padraig Harrington yesterday at Transitions? Harrington comes out roaring with a 10-under 61 in the first round, and is already -1 for the day today, still leading the pack. Meanwhile, Tiger Woods says no Achilles heel, or in this case, tendon, will keep him from the Masters. I just hope his game keeps him in through the Masters weekend. And Rory McIlroy continues leading the FedExCup points, not to mention the official world golf ranking. Oh, yeah, AND the money rankings. I’m keeping my eye on a few golfers for the Masters, we golfers’ SuperBowl of Golf. Yes, Rory should be in the running this year, but I also have my eye on Phil Mickelson, Steve Stricker, Lee Westwood, and Keegan Bradley. We’re only a couple of weeks away, so we’ll see how they stack up the next two weeks. Turbo is 12 for 16 thus far in his brackets for the 2012 NCAA Men's Basketball Tournament. Then, there’s the NCAA men’s basketball tournament. 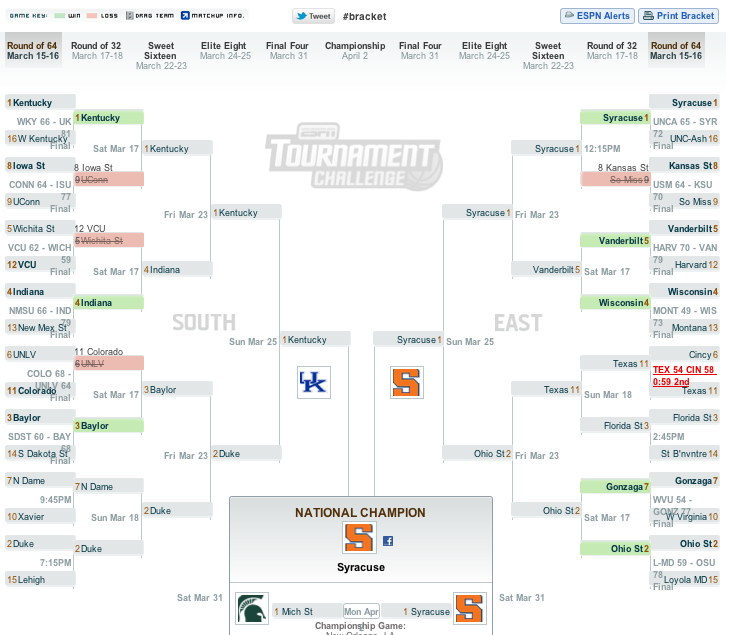 I went to ESPN and picked my brackets the other day, and so far, I’ve had four bad picks and twelve good ones. Pretty good for not having really handicapped the teams this year. Although my Texas Longhorns had better get it together — they currently trail Cincinnatti by 3 in the 2nd. Way over in another part of the world, congratulations go out to Sachin Tendulkar, cricket “god,” who finally scored his 100th international ton in a match against Bangaladesh earlier today (a match which, in a theme not unfamiliar to Indian cricket fans, India lost!). And my Premiere League fave, Manchester United, lost 2-1 to Athletic Bilbao in the Europa League, exiting them from this year’s tourney. This will be the first time since the 2001-02 season they won’t contest a cup final. And alas, for you fans of the new HBO David Milch series about horse-racing, “Luck,” well, you won’t have much of it. The series’ filming has been stopped due to some horse-racing deaths (three so far) during production. Once again, a Milch series won’t make it to the HBO finish line, leaving the series’ denoeument to its viewers’ imagination (the same thing happened to “Deadwood,” some of the most brilliant TV I’d seen in years). Too bad, the characters’ complexity were just coming more clearly into view, with stellar performances by Dustin Hoffman and Nick Nolte, among others, and the cinematography some of the most gorgeous I’d seen on TV in eons. In the beginning, i would like to thanks such an interesting and informative blog post here. I always used to read all your blogs posts but this one was really important and valuable for me. My thoughts and your thoughts which you shares are almost the same and it is really great to see it. Thanks.